The development in brushless motor design and LiPo battery technology have greatly benefited the RC hobby especially for wannabe jet pilots. Electric ducted fan (EDF) jets have become one of the most popular segments of the RC modeling hobby and the development of these speed demons is nothing short of amazing. When most people talk about RC jets, the first part of the conversation always focuses on speed. But that’s just one part of the e-jet equation. This article covers the basics of power system and airframe setup, showing the various choices and options available to the wannabe jetster. 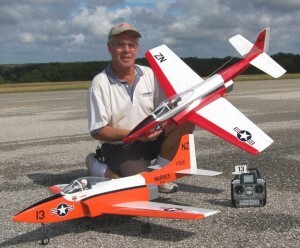 From low-time beginners to the advanced RC pilots, there’s something for all skill levels. To begin with electric powered jets fall into two categories: prop jets and electric ducted fan (EDF) jets. 1. Prop Jets: As the name implies, these jets can look just like full-size jets but they get their propulsion from an electric motor and propeller. Prop jets can be further sub-divided into pushers and tractors. The pusher configuration has the motor and prop mounted in the tail of the fuselage, while tractor prop jets (usually lightweight sheet-foam flyers) have the motor and prop facing the front. Some jets split the difference with the propeller positioned (tractor or pusher) located within the fuselage/wing area in a tight-fitting slot cut into the model. 2. EDFs: Electric ducted fan jets have also developed a few different approaches. These include: fully enclosed and exposed electric ducted fan units, type of construction, impeller diameter and method of inlet air ducting. Regardless of configuration, the heart of the EDF jets is the ducted fan unit. The unit is comprised of the outer body or duct, an inlet ring or lip at the front of the duct that smoothly guides the airflow into the duct, a precisely fitting multi-blade impeller that driven by an electric motor, the hub which is the central part of the impeller that attaches to the motor’s prop shaft and coupler, and stators which are stationary vanes that help straighten the swirling airflow produced by the spinning impeller. Some jet designs rely on large opening (cheater holes) to draw the air into the EDF unit while others are equipped with internal air ducting that channels the air into the impellers and exhaust tubes to direct the thrust out of the back of the jet. 3. Foam construction: Foam is an extremely popular building material for jets and here you can find complex all-molded-foam ARFs and simpler flat-foam-sheet kits you have to assemble and glue together. Both have their advantages and they vary in price according to the amount of included hardware and accessories. Foam jets are usually are smaller and lighter than built-up wood and fiberglass jest and so they can be powered by less expensive less powerful power systems and controlled by budget servos and radio gear. 4. Composite jets: A step up from the foamie flyers is the composite/wood designs. These jets come with a molded fiberglass fuselage with built-up wood wing panels and control surfaces. Usually they come already painted and covered but are still very easy to assemble. The sophistication and complexity of these types of jets vary greatly and so do their price tags. There are composite jets available for a few hundred dollars while others are priced at several thousand. Again, it is all a factor of what is included in the box and the quality of the power systems and components used. Size is a factor as well as the controls features. If you have flaps and retractable landing gear you’ll pay more but you’ll also enjoy more performance. 5. Proper gear A very important thing to consider is the quality of your radio gear. The lighter and simpler your model is, the less expensive and powerful your servos have to be. As the weight and speed of your jet increases, the flight loads and demands on your servos also increase. Ten dollar mini servos are just fine for small, lower speed jets. For the mid to upper end of the jet range you should consider more expensive and powerful servos that range from 40 to 60 oz.-in. of torque. Also, as speeds increase, servo centering and precision also becomes more important. As with everything else in this world, speed is expensive. 6. Pilot training Flying exciting EDFs such as the E-flite Habu 32 or the BVM Electra Jet is exhilarating but not especially difficult. It is here you have to evaluate your own piloting skills. If you are a beginner, you should first learn to fly normal prop driven airplanes first and get comfortable with flying faster and faster. Low-wing, aileron-equipped high-performance sport planes are great for pilot training. Then when you are real comfortable with speed, move up to something sleeker with less drag like a flying wing. One of the best trainer airplanes for the budding jet pilot is the new ParkZone Stryker F-27Q. An advanced molded foam flying wing design, it is by definition a prop/pusher jet. Flying wings with their reduced drag and increased speed are extremely well suited for pilot training. When you are comfortable with speedy flying wings, you’ll be ready for jets. 7. Flight control: Another interesting difference between flying jets and typical propeller airplanes is that with jets, there is no prop blast directing airflow over the wing and control surfaces. Conventional airplane pilots can get accustomed to the almost instant thrust and increased control response by simply punching the throttle. The propeller both propels the airplane forward and blanks the control surfaces with plenty of airflow. It’s like power steering, a lot of control with little effort. For a jet to produce thrust however, it depends on smooth airflow into the EDF unit. Sharp maneuvers can interrupt and reduce this airflow leading to less thrust and less speed. There is no increased airflow and what control you have all depends of maintaining forward airspeed. This is not at all difficult to master, but it is something to keep in the back of your mind when you consider doing low and slow hot-dogging with your jet. .
8. Flight ops: One thing that the new “speed freak” may overlook before buying his first jet is evaluating the condition of his home base of operations. What’s your flying field like? Is it a well manicured sod field with a pool table-smooth surface? Do you have a paved runway? Or, is it the local soccer field? If you are flying off of shaggy grass, it would be best to fly smaller, hand-launchable foamie jets. Typically, the wheels on jet landing gear are smaller than your average RC sport plane and they won’t even roll in tall grass. Skip the landing gear and give it a toss. For more advanced jets, you’ll need a smooth runway and if you have retracts, the smoother, the better. When you travel to e-jet events most are hosted by clubs that have access to smooth tarmac for effortless takeoffs and landings regardless of wheel diameter. So, evaluate your own base of operations and fly something accordingly. There is a gray area in model jet size, where some models are a little too big for a comfortable hand launch but not quite big enough for a set of landing gear for rise-off-ground takeoffs. Here you can take a hint from the glider guys and use a bungee launch system. Nothing more than a length of surgical tubing, a stake, ring and some nylon cord, the bungee launch is the best compromise. For your average four to five pound EDF a 30- to 40-foot length of 3/16- to ¼-inch surgical tubing will do nicely. A 12-inch tent stake anchors one end and a tow ring tied to the other is attached to the launch hook. The hook should be an inch or two forward of the plane’s CG for smooth launches. The longer the bungee the better; you want a constant, smooth pull for a longer time. Shorter lengths produce more aggressive pulls but they are shorter in duration. How much pull? A good way to fin-tune your launch system is to use a fish scale and pull the launch cord back so it pulls four or five times the weight of your model. For a four-pound jet that would be 16 to 20 pounds of pull. Hold the model low with its tail just touching the ground with the nose pointed up just slightly. Have a buddy hold the plane and when you’re ready have him release it. Have a little up trim dialed in and concentrate on keeping the wings level and the upward flight path angle shallow until you have sufficient airspeed for your first turn. In the air is where jets are supposed to be and flying at high speed is a thrill all by itself. But things happen quicker with jets and they can become very small very quickly if you just fly them in a straight line away from yourself. The best jet pilots fly with a flight plan and they stick to the plan until they land. It can be very easy to mentally fall behind a fast jet. Have a simple mission; don’t just bore holes in the sky. 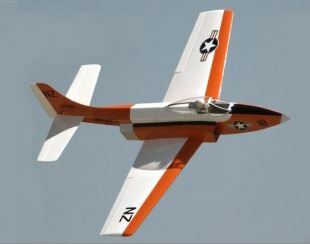 If it’s a first flight, concentrate in trimming the model for straight and level and fly around the pattern at a safe altitude at different speeds to see how the model reacts. If you have some time on your jet, then practice landing approaches and being smooth. For more advanced jets, practice flying with the flaps and landing gear up and down, and consider setting up Flight Modes with your computer radio to easy the pilot load. Have one setting for takeoff, one for general flying and a thirds to set up your model’s landing configuration. When it comes to turning around, use large smooth sweeping turns to keep your model in the groove and to maintain airspeed. A favorite maneuver for turning around and reversing directions without going out too far are vertical ones. At the end of a speed run pull into a vertical line and do a half-roll and pull half a loop to come back down into straight and level going the opposite direction. To swap directions and gain altitude do a half loop and at the top half roll back into level flight. Once you decide to join the jet set for some fun and excitement in the fast lane, these tips will help you stay ahead of the learning curve. Electric jets are a great way to feed that need for speed! Go ballistic!